This picture has BLOWN UP on pinterest lately. My in-real-life friends are commenting about how they’ve seen Garrett being repinned all over the place. It’s amazing. And cue me falling out on the floor. No, not really. But it made me extremely happy that a prestigious professional photographer like Charlie Pappas would recognize MY picture! After class I asked him where he had seen it and he said it was all over Pinterest. Well. Yes, yes it is. This little picture that I snapped by the seat of my pants one night has gone completely viral on Pinterest in the past few months. And just when it seems to slow down for a minute and stop getting pinned so much, another big name blogger with a huge following will repin it and start the ball rolling again. It’s like hitting the jackpot over and over in terms of blog hits! Earlier in the weekend I was working on some things on my blog and noticed that my stats were changing before my eyes. My sitemeter literally went from 300 views to 3,500 views in a little under an hour. When I clicked to see where they were coming from, it took me to Sherry @Young House Love’s pinterest board. Cha-Ching! So THAT explains the increase in traffic in mere minutes! And that, friends, is the power of pinterest. If you are a blogger and haven’t joined pinterest yet, you really should! Good photos, ideas, tips and tutorials spread like wildfire around that place, which in turn brings more traffic back to your blog. Talk about free advertising. If you scroll down through my Christmas sign giveaway, notice how many comments were from people who found me via pinterest. I welcome every single one of you guys to my blog! I’m SO happy that you’re all here! Wanna see something even more staggering? Check this out– Here is a screenshot of my google analytics traffic referrals from pinterest. 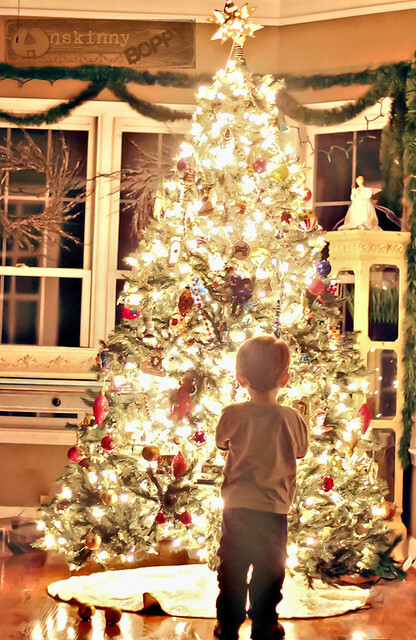 Now I have no way of tracking which pins leads to my blog, but based on the number of times this Christmas tree photo shows up in my pinterest feed, I’d say the majority of these hits come from it. The next highest referrer (Hi, Dustykins!) is All Things G&D at 2,867. That’s just a bit of a spread, no? I’m in total awe of the popularity of this photo. And I SO appreciate every single one of you who have repinned my photo, especially those of you who took the time to read my tutorial and then peruse my blog while you were here. That really means a lot to me. I love all the comments I’ve gotten on the post, as well. It sure has been controversial. I promise my settings in the blog entry are correct, even if some of you refuse to believe it. Considering that I was standing all the way across my house to get the shot, it wasn’t like I was focused in on one tiny detail. Maybe that had something to do with why it’s not blurry around the edges. I honestly don’t know how it happened so I can’t put in my two cents about it really. I guess I just got lucky with my 1.8 lens that time. I also know that some folks don’t like that the original unedited photo was so grainy, and I didn’t either. Hence the reason I edited it pretty heavily in Lightroom. This year I plan on trying a whole lot more shots like this. Granted, I might have to make a life-sized cardboard cut out of my son to get him to stand that still ever again. Ha! 1. Join Pinterest. Today. If you need an invite to Pinterest post your email addy in the comments (or send it to me at [email protected]) and I will give you an invite, no strings attached! You can follow my boards here if you need a starting point. Then just start pinning your best ideas or tips. Repin other stuff, too, so you don’t look like a massive attention whore who only pins their own stuff. But don’t be scared to sprinkle some of your best ideas in the mix, as well. 2. Watermark your photos in some way, if only for the name recognition it will give you. I just today added a custom watermark to these pictures. Thanks to the incredible Lori Gordon of Shooting Star Photography for showing me how to do that! I had no clue how to add a watermark to my photos but Lori was kind enough to help me out with that today. It was super easy, and I’m planning to share how she did it with all of you very soon. (UPDATE: CLICK HERE to read how to watermark your photos!) It’s something that every blogger needs to do, and up until this point I’ve just been too lazy to do it. After seeing my photos flying all around the internet without my name on them, I regret not learning this sooner. I’m in the process of watermarking some of my older more popular posts but hopefully they will work their way into the system soon. Here’s a big thanks to Click Workshops for teaching me this trick so that I could pass it along to others. And to everyone in Pinterestville, thanks SO much for all the link love this past year! I hope that every blogger out there gets to experience the power of Pinterest at least once or twice or MORE! It’s such an exhilarating feeling to watch your photos and ideas be well received by so many others. Also thanks to my friend Lisa for introducing me to Pinterest when Pinterest wasn’t cool. I’m so glad I received one of her much coveted invites when I did! Y’all be sure to hit me up if you need an invite, ok? I’m happy to spread the love. This is SO exciting, Beth! You should be so proud of yourself! I’ve always loved that photo, and with those stats everyone else does too! Woot! thanks for the tutorial, am looking forward to more! You go go go girl!!! So so cool, Beth. It is such a great picture! That is so cool Beth!!!! Although, I knew you were talented way before Pinterest! LOL!!!! I actually am one of the rare few it seems that doesn’t have that picture in my Pinterest but going to add it now my friend!!!! So excited and thrilled for you!! I just found you but I’m not even sure how I got here?!?! All I know is I’m so glad I did. Love your style and I look forward to getting to know you better! CONGRATS! I was one of those that pinned that cute and wonderful photo. Hope I’ll be able to direct more traffic to my blog one day too :). That is, when I have good content like you! I have pinned that photo and I adore it! You are indeed all over pinterest and deservedly so. I actually host a Pinterest linky party each week and this week’s has just started. I would be so honoured if you could link up this post as I’m sure a few of my bloggy friends would love to know the origins of that picture!! I just love *knowing* someone famous! 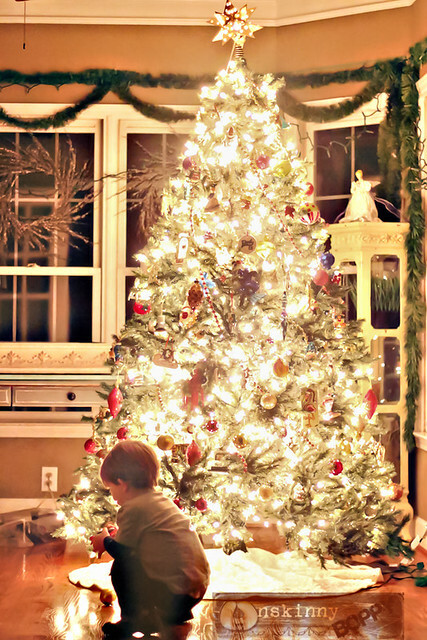 Gorgeous tree and precious little boy. Happy Pinning! Thank you do much sweetie. I just purchased my first DSLR and I am enjoying getting picture taking ideas for the upcoming holidays. Thanks! I just wanted to pop back and say thank you for linking up! I also wanted to let you know that I have tried your tips and even though my pictures look nowhere near as stunning as yours there has been a bit of an improvement on last year’s shots! Yeah, pinterest is awesome! I found your blog through that very pic. I am SwissMaedel on there. I’m a pinning fool. Love your blog so far and will continue reading it. Blessings. I have looked at this photo, and followed your insturctions…but it does not turn out well. Can you post your before photo? Maybe my picture is similar, but needs to be edited. What did you do in lightroom? When I edited it in LR I mainly reduced the noise and sharpened it up some. I actually UNDER exposed the tree a little to knock off some of the brightness. I bet the difference in your pics vs mine is the lens. That 1.8 lens lets in so much light it’s insane. Are you using it or something different? I saw your photo multiple times while scrolling through waiting for my invite from Pinterest. Would love an invite from you to get me started. [email protected] Thanks in advance! I am so excited to find your photo on Pinterest and was able to take a very lovely pic of my tree this year. The best ever! Not nearly as good as yours, but I will take it! I linked up with you on my personal blog. Thanks again! I love your pic, how did you capture the glow of the light, flash or no flash? I would love to sign up for Pinterest also, but haven’t had an invite yet. Congrats Beth! I am just now coming back to the virtual world and when I saw this all over pinterest…all I could think was –> how AWESOME for you!! It is still quite popular and will be b/c it is a darling photo. Oh my gosh, I remember TheBryansWeBe from the nest! You got a new home! Wow, small (online) world, I used to drool over your home bio! Really great site! I happened upon you from a Pinterest report that Tiffany Dow wrote and WOW how cool! I can see why that picture went viral – it is beautiful and really gives the “glow” of Christmas warm and fuzzies! Excited to see what else you write about! Hi, Beth, just got here from Pinterest (where I had to do a search to find the original post, but worth every second) Thank you for posting the instructions to getting the awesome tree pic, but more specially, thank you for the tips in the comments on reducing noise, sharpening the pic and underexpose the tree after the fact. The original picture is what drew me here, but as soon as I saw the one above, I knew it had been enhanced, and boy, what a difference it makes! I love it!